MOBILE STRATEGY: APPLE OR MANGO? If you already do not know what I mean by ‘Mango’ here, it is the code name for Microsoft’s latest mobile platform ‘windows phone 7.x’. We develop applications for both Apple (iOS) and Mango (Windows Phone 7.x). I wish Microsoft released this platform couple of years ago. Microsoft provides unprecedented power to mobile developers with their platform. It takes very good developers to put out stunning iPhone (iOS) applications. With all the nice things available in Mango (especially Silverlight), even average developers can produce cool applications in fraction of the time it takes on iOS. With iOS, you cannot make applications look cool without involving decent designers. 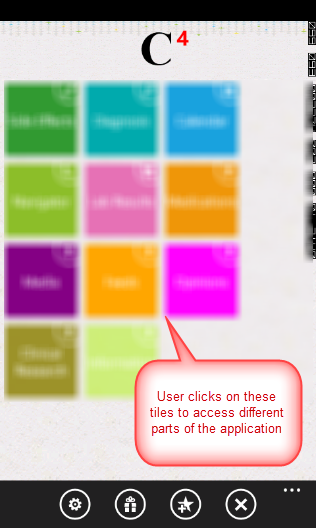 Where as Silverlight on Mango, provides so many options to visualize your information. Until very recently most of the windows applications were written using Visual Basic, not because it was one of the great languages, but there were millions of Visual Basic programmers. History might repeat again on their mobile platform. There are millions of .NET developers. They do NOT have to learn anything new to start cranking out Mobile applications on Mango. Where as iOS needs to have MAC machine, Knowledge of XCODE (Objective C). Many people find that to be a steep learning curve. Just like Apple closed their hardware architecture and let Bill Gates beat them with Open (Intel) hardware architecture in the PC market, Mango might help them comeback in the Mobile Market. 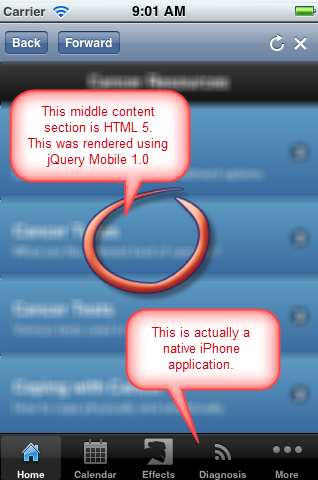 It is possible to combine HTML5 and Native application in your mobile solutions. You can make use of HTML5, jQuery Mobile and other technologies to build part of your application which could be used as-is in all the mobile platforms. The following picture shows how we used hybrid approach in our application. I wanted to write about this for a very long time, never had a chance. In most of the businesses, it has become a ‘necessity’ to think about ‘mobile strategy’. There is so much being written about HTML5 and how it is going to make your mobile service delivery easy etc. The fact that you develop ‘once’ and support on all the major mobile devices is a very tempting option. But, this is where you have to make tough choices. We did a prototype using HTML5 and started using the application. It did not take us long to realize that UX (user experience) was very poor. It was nowhere close to the UX you get from the native applications. We had to make a call; it was not an easy decision to make (or is it?). 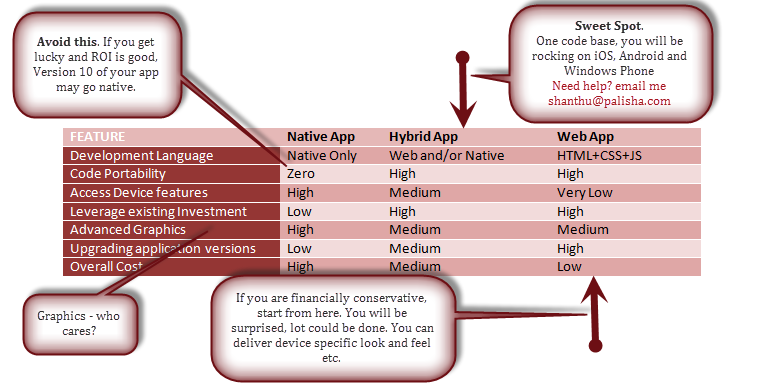 If you go with native applications, your cost and time will increase tremendously (separate development tools, resources, code base, testing, deployment etc.). In this competitive world, if you do not provide the best, customer will go somewhere else. In spite of cost and time issues, we decided to go with native applications. Today, we are glad that we took that path.